Visit the 19th edition of the mask & puppet festival in Markala! 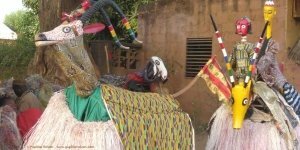 The Festival des Masques et Marionnettes de Markala has been listed as a cultural heritage by the Malian government. And for good reason! From Ségou we take you on a trip on the River Niger. Along the way riverside villages are visited before arriving in Markala, where the afternoon and evening are all about the annual festival. On Sunday morning the trip goes back to Ségou. A relaxing weekend in pleasant surroundings with a touch of culture. Visit the travel page for more information about the upcoming river trip. You prefer a day-trip by car? Contact us for information and a tailor-made offer.